Hello! My name is Allison and I am excited to be a first-time chef at the Moda Bake Shop. It was a delight to come up with this layer cake pattern. 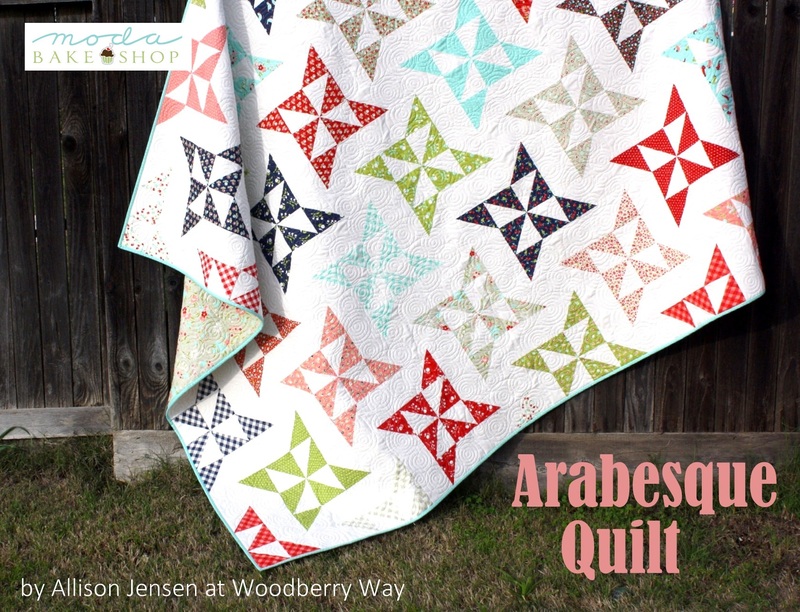 I named it “Arabesque” because it reminds me of a class of tiny twirling dancers, but the boys at my house call it the “Ninja Star Quilt”. You can find more quilts from me at woodberryway.com where I have recently started blogging. This quilt top finishes at 86″ x 71″. 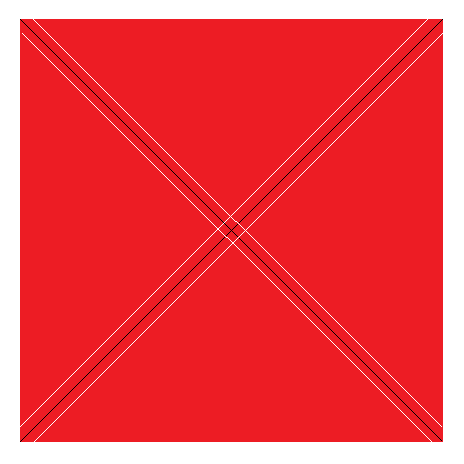 You should have 34 background squares and 34 print squares. 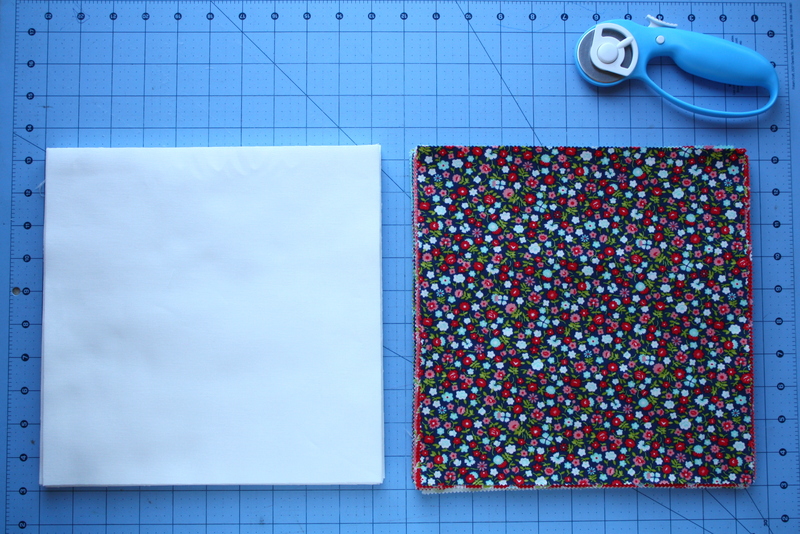 Put one of layer cake square right side together with a background square. 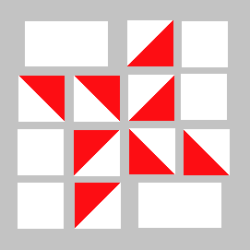 Mark diagonal lines, as shown in black, and sew 1/4″ along each side of both lines, as shown in white. Give them a good press after that to make cutting easier. 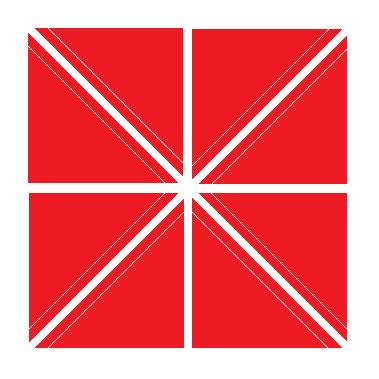 Cut along your marked lines, as well as half way (at the 5″ mark) horizontally and vertically. 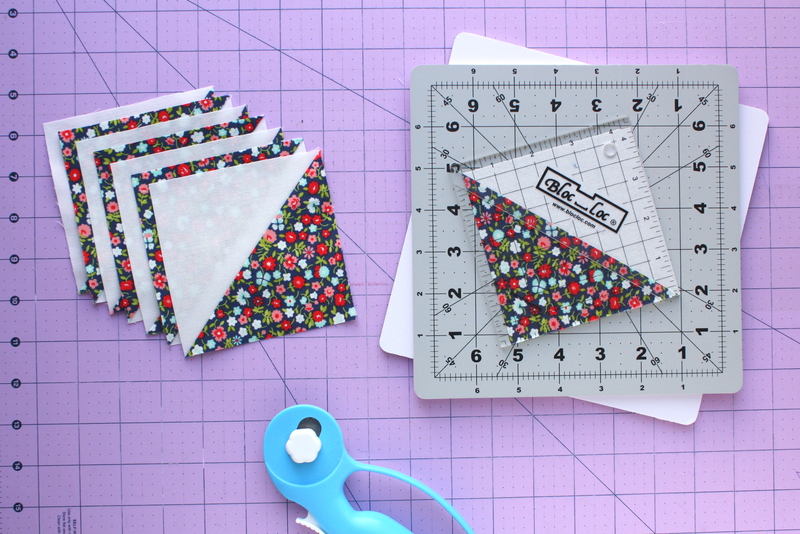 You should have 34 stacks of (8) HSTs for each print. I arranged my color stacks first to decide placement, and then started to fill in the background pieces, as switching around the layout on this particular quilt can be tedious. Begin to lay out your stars in this manner, with background rectangles on the upper left and lower right. As you lay them out the stars will interlock with one another. 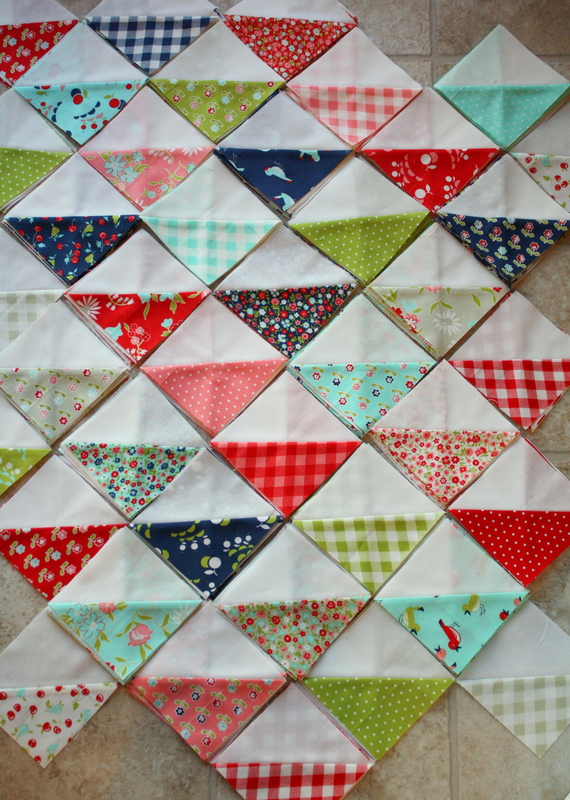 Be sure not to place any background rectangles vertically, or you won’t be able to sew your rows together. Continue to lay out interlocking stars following this model until you have reached a 19 x 23 grid. You will have a few partial stacks left over. Sew pieces into horizontal rows, and then sew rows together. I like to press rows alternating directions and use “nesting seams” so I don’t have to pin. I do pin at the center of each pinwheel to make sure that point is perfect. Once the rows are sewn together, you have a quilt top! Back, baste, and bind according to your preferred method. There are lots of wonderful tutorials out there for these steps if you’re just beginning. Red Pepper Quilts has a great binding tutorial, and Lella Boutique has some tricky tricks! Here are a few different color options to get your imagination going. Thank you so much for reading this pattern. If you decide to make this quilt, please tag me on Instagram, I would really love to see it! I’m @woodberry_way (formerly @Marquitta_Quilts). This quilt finishes at 86″ x 71″. 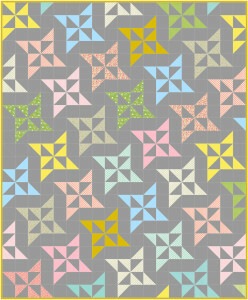 This entry was posted in Easy, Layer Cake, Quilt and tagged Bella Solids, Bonnie and Camille, Vintage Picnic. Love this block! I’ve been making several blocks that require hst’s and I made my granddaughter one with all hst’s. I think this will be great for me. I sure thank you. I will make this one. You are so welcome. I’m very glad you like it! Can this be fixed, so I can make a pdf a save the file. I would love to make this quilt. Yes, I had that problem also. I thank you for mentioning it. 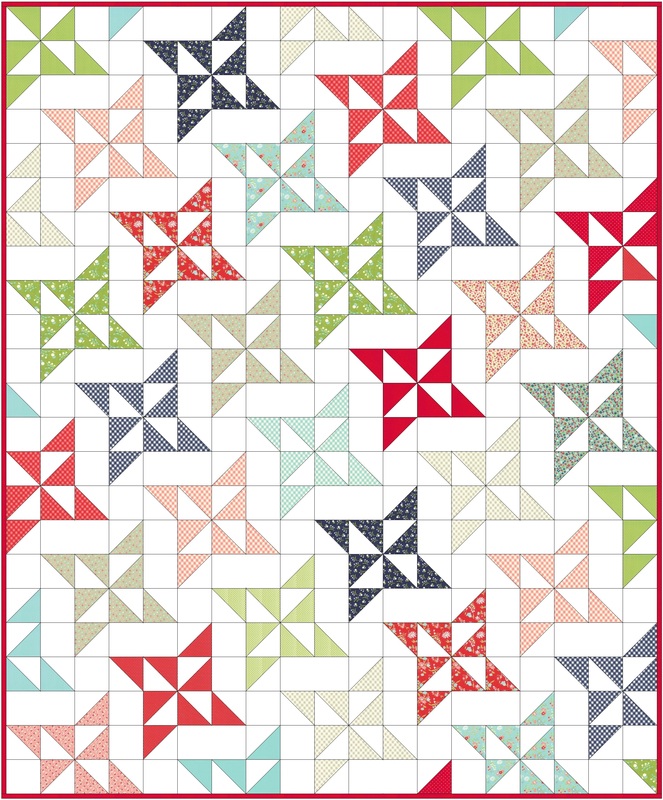 Love to make a scrappy quilt with this pattern but I’m having the same problems as the others ..
Pinwheels are always fun and impressive, but this makes it look like you are doing extraordinarily hard work! Adorable quilt! I’m moving it to the top of my list! The hardest part for me is leaving out any prints, so I will probably make it larger and use some yardage to make extra blocks as needed. Adorable quilt! I’m moving it to the top of my list! Very fun, Alison! Thank you for sharing! Hope you will be a chef again, soon! I’m sure MBS will get the printing fixed tomorrow, and will check back then. They are usually quick to fix these things. Thank you so much Gayle! I’m really glad you like it, and that you’re going to make a bigger one! 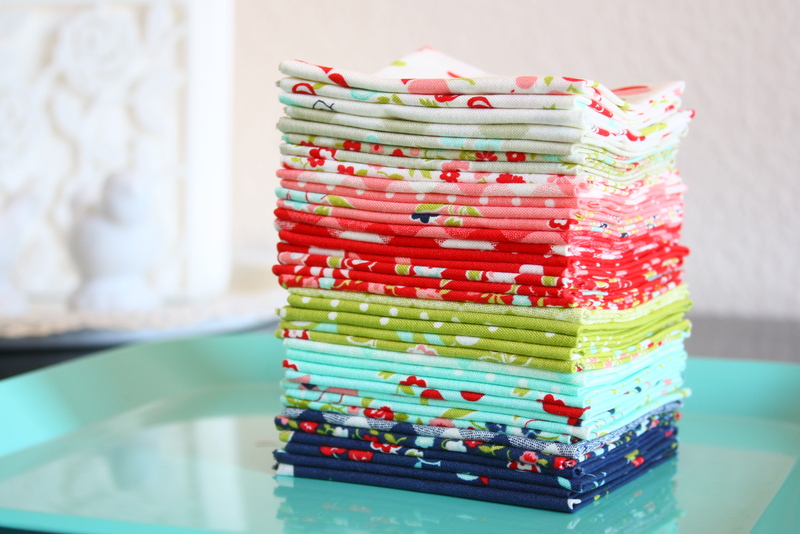 Love this block and how the whole quilt looks with this fabric! Looking forward to being able to print the pattern! Thank You Allison for designing this! Please send us a fix!!! This is a great quilt for shop! I’m so sorry it’s not working! I don’t have the ability to fix it, but I’m sure it will be taken care of soon. This is a beautiful quilt. I am going to make it because I have a zillion layer cakes. I tried as well to print the pattern using the printer friendly version but only the picture shows up. 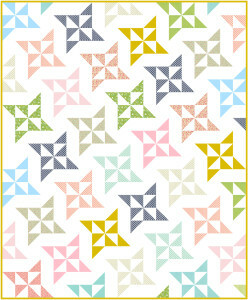 I love this quilt, but I am also having a problem with the Printer Friendly download. can you tell us what Layer Cake you used? Gorgeous quilt! Bonnie and Camille would be my fav too–doesn’t matter which line of theirs either, LOL. The Printer Friendly Link has been updated! Allison, I love this quilt. Great job! It’s adorable that your boys call it the Ninja Star Quilt! Thanks Lisa! I’ve always loved the MBS and it’s exciting to be a part of it. Thanks for having me! 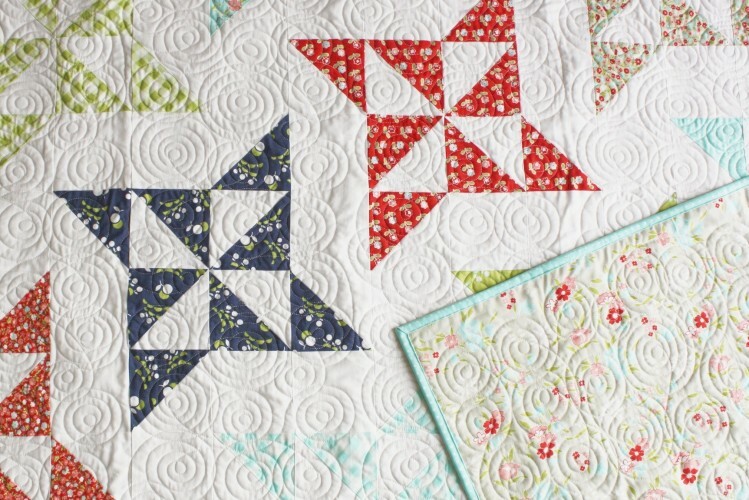 Love this quilt and the pinwheel block! What a clever girl you are! Such a beautiful quilt. I love the quilting design on your quilt. Love this quilt and great job on the tutorial. Reminds me of summer. I don’t have a Bonnie and Camille layer cake but I can dig in to my ever growing stack of Bonnie and Camille fat quarters. Great job on your first time with MBS. PS I also love your quilting design on your quilt! You could make this with charm packs, too, if that’s what you have. I love this quilt design and fabrics! Putting this on my to do list! Thank you Pam! I’m so glad you like it!